This article applies to Windows, and explains how to get Windows to clear and release a print job that is stuck in the Windows Print Queue. Print jobs remain in the print queue after the jobs were successfully sent to the printer. If the print jobs have the status of ‘Sent to printer’ or ‘Printed’, then the jobs were already sent to the printer. If the jobs remain in the queue, it is because the system administrator set the print queue to retain the print jobs after they were printed. Since the print job was already sent to the printer and the printer is frozen due to the fact it cannot complete the print job, the Windows print queue will not release it. 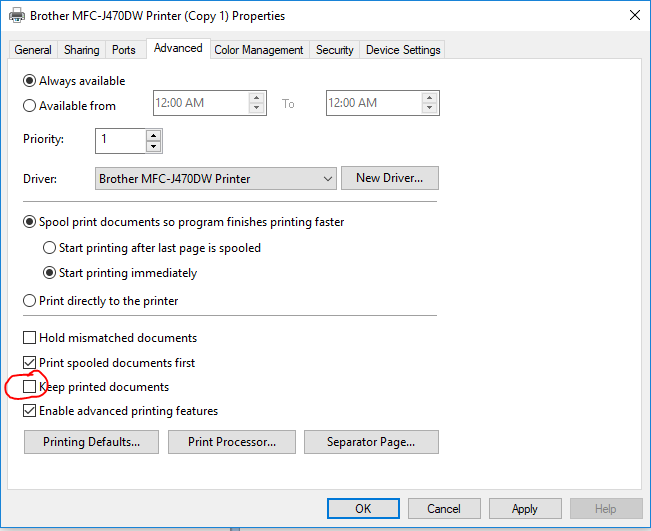 Select the print job(s) you wish to delete, right-click and select cancel. Depending on your security setting, you many not have permission to perform this task. In the Advanced tab of Printer Properties, uncheck the ‘Keep printed documents’.